While overall poverty in Ghana has been reduced by almost half in recent years, rural poverty has barely dropped and an estimated 40 per cent of the population here in Ghana’s drought-prone Northern Region continues to face chronic food insecurity, as well as a lack of infrastructure, basic social services and safe drinking water. Tamale has a population of approximately 360,000 and is the capital of the Northern Region of Ghana – one of the poorest of the country. Contrary to other urban centres in Ghana, Tamale consists of a mix of modern buildings and traditional mud block houses. The region is inhabited by different ethnic groups, and in rural areas the tribe, its traditions and chiefs hold important roles in communal life. In the last decades there has repeatedly been armed conflict between ethnic groups over land rights, political representation and religion. These recurring conflicts, along with the extreme levels of poverty in the region, have led to a great rural exodus, with thousands migrating to southern urban areas. In the agricultural society of the North, women play an integral part in all farming activities, in addition to rearing children, household tasks, and fetching water and firewood. Fetching water alone can take up to 70 minutes each day and girls and women are responsible for this. Despite recent government efforts to ensure free basic education for all, the gender disparity between enrolment and retention of girls and boys at all levels of education remains very pronounced in the Northern Region: around 65 per cent of females are estimated to have no form of formal education whatsoever. This is in part due to poverty and the amount of work expected of girls in the home, and in part due to early marriage, preference of boys, and religious practices. A lack of education impedes girls’ future socio-economic success and makes it harder for them to break the cycle of poverty as adults. A phenomenon that has increasingly affected girls and women, especially those from poor, rural areas, is the branding and persecution of females as witches. This can affect babies as young as one month old. The baby, child or woman is accused of employing witchcraft to cause a death or illness, or even a business failure or financial difficulties, and is physically brutalised, tortured, abandoned or killed. In northern Ghana, there are so-called “witch camps” where these women take refuge, never to return to their communities. Around 1,000 women and 700 girls are estimated to be living here. Psychiatrists have said that in some cases, these women are suffering from mental illness; education on mental health issues is therefore also urgently required. SOS Children’s Villages began working in Tamale in 2008. Today, the SOS Social Centre here provides a family strengthening programme to members of the local community in need of support. The programme ensures that children have access to essential educational, nutritional and health services. It provides guidance to parents in the areas of income generation and parenting skills and strengthens support systems for vulnerable children and their families within the community. Overall, the programme aims to support struggling families so that children can experience a safe and nurturing childhood and will not be abandoned. Around 1,000 people receive social and material support here. The SOS Medical Centre in Tamale treats up to 12,000 members of the community each year who would otherwise not be able to afford medical treatment. It provides basic health services, such as treatment of infectious and non-infectious diseases, surgery, and family planning services. The medical centre also provides food, medication and psychological assistance to individuals and families, including those affected by HIV/AIDS. The children attend the SOS Kindergarten together with local children from the community. They then go on to complete their primary education at the SOS Hermann Gmeiner School. 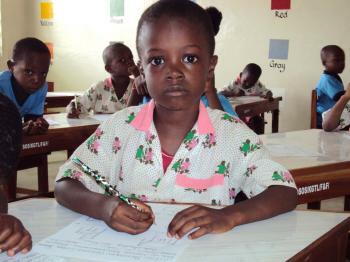 Around 320 pupils from the children’s village and the neighbourhood attend the school. This way, children who grow up in an SOS family are integrated into the local community from a young age.